For some people, developing a company from the ground up is challenging. You spend long weekends and sleepless nights making that perfect product. If you succeed, that first big pay check comes to mind. I found a Monmouth nine-year-old’s response refreshingly surprising, on the eve of his own product line launch November 5. Maxwell Lanfrank is an entrepreneur, and the head of MoMax Enterprizes. Lanfrank’s firm has the police sirens turned on around Monmouth County, but don’t worry, the yellow caution tape isn’t coming out. He’s devoted to them. Lanfrank’s story really begins way back a whole year, at the tender age of eight, when he went horseback riding with his aunt. And, of all things, it was an aloe plant that she gave to him after the ride that set the wheels in motion. “He’s always been the kid that wonders, ‘why.’ Why something happens, how do I make this, where does something go after it’s been put in the garbage can,” said Max’s mother, Kristen, adding that Max’s aversion to germs – and his vision – led him to turn the aloe plant into an organic hand sanitizer. 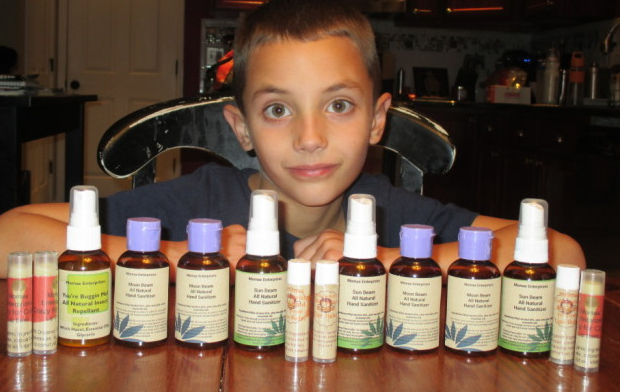 Soon he brought this idea to his grandmother’s house, They call her “Mom Mom.” Max’s grandmother is interested in essential oils and all-natural healing. Once Max told her about his idea the company “MoMax” was born. "Maxwell Lanfrank is like most 8-year-old boys at the Jersey Shore: he loves the outdoors, he plays Pop Warner football, he goes fishing with his dad, and he’s a bit curious. But unlike most of his peers, Maxwell spends a portion of his weekends in a lab (well, actually a kitchen posing as a lab) mixing ingredients to make his own line of all-natural hand sanitizer and lip balm."